Christ Has Returned. April 1, 2012, CE. American Atheists Disbanded. » « Last Chance for a Catholic Hamburger. 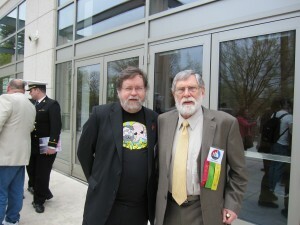 Here is a photo of PZ and Edwin at the AA Convention, March 2012. PZ gave a talk. And it was a good one too. It really was! * Please don’t tell PZ I called him a teddybear.